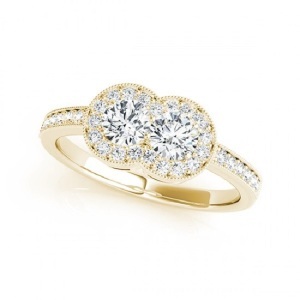 Much as three stone rings represent your past, present, and future, two stone engagement rings are also rich in meaning. These rings represent the deeper levels of your relationship with one stone representing your friendship and the other representing your love. For many couples, love is not only about the romance. It's also about the many things you share together. The laughter, the fun, the adventures, the ups and downs, and the close bond you have that makes your relationship stronger. It is this dual nature of love and friendship that make for strong, long-lasting marriages. If your love is also your best friend, your partner in crime, and the person you want to share every single moment with, then this ring is sure to be a romantic choice for your engagement. 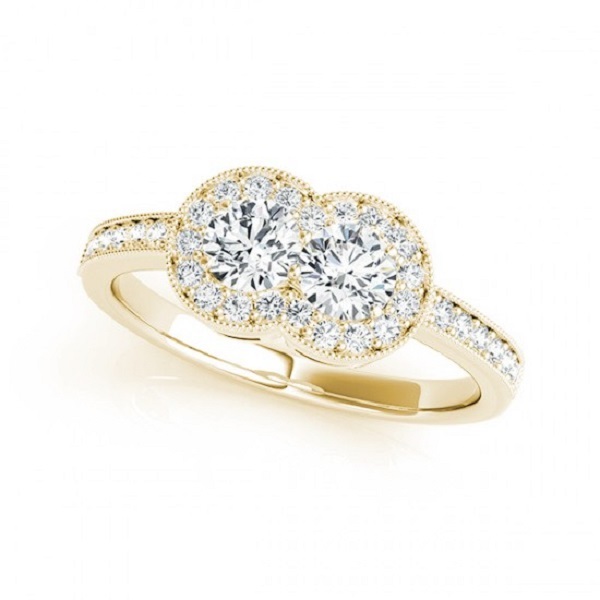 Keep reading to get inspired by these gorgeous two stone engagement rings. 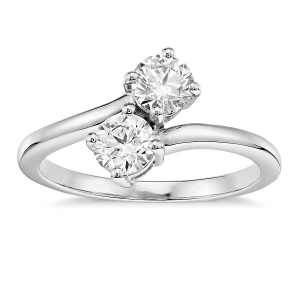 Ideal for future brides who prefer their rings on the classic side, this elegant ring has a plain band and two diamonds set alongside each other. This ring works well in platinum and diamond but could also work equally well in any metal and stone of your choice. 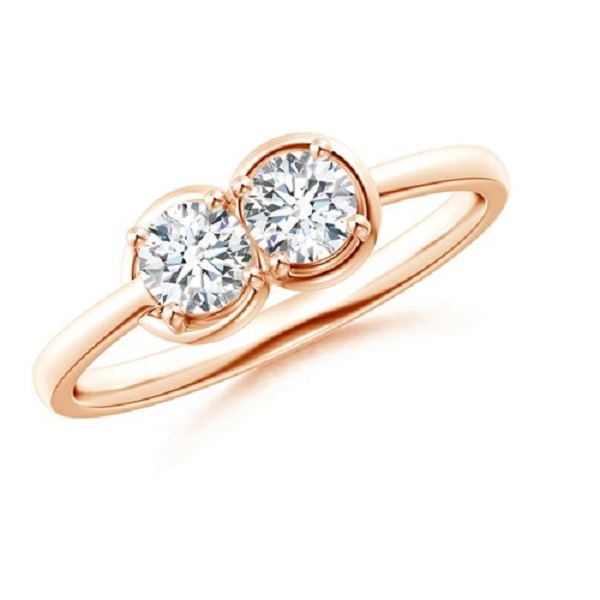 Try something soft and romantic such as morganite and rose gold, keep it classic with white or yellow gold and diamond or mix things up with contrasting stones. Pear cut rings are timeless and elegant. With a rounded shape that tapers to a point, this cut is also known as a teardrop cut. The unique open shape of this ring enhances the pear cut, adding interest in a subtle way. It would work well in any metal of your choice, with diamonds or any other stone. Pave stones have been used around the pear for added effect. Pave stones are also used to perfection in this glamorous ring. With its twisted band, the two diamonds are centred in a way that draws the eye. 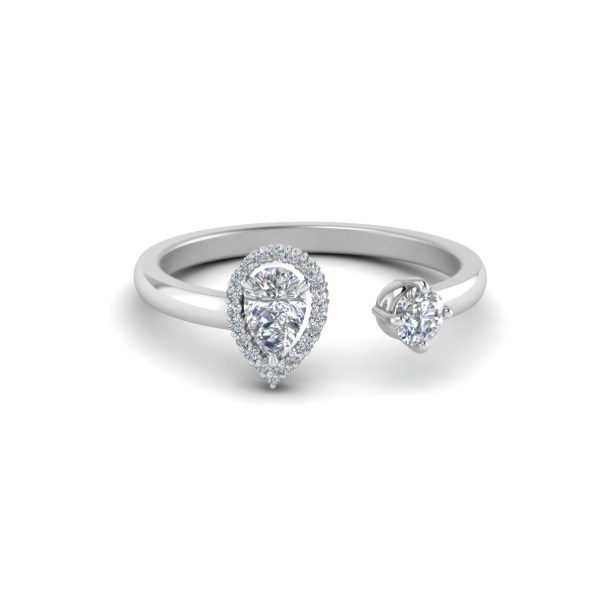 Tiny pave stones surrounded the stones, accentuating the twist even further. The contrast of gold and diamond works well in this design but a cooler toned metal would also work. This minimal ring is understated and surprisingly sophisticated. Its stones are positioned in the centre in a simple setting that seems to merge the rings. The result is an infinity knot. The symbolism of this will appeal to romantics, who know that the line of friendship and love is often blurred in marriage, creating a truly unique relationship. 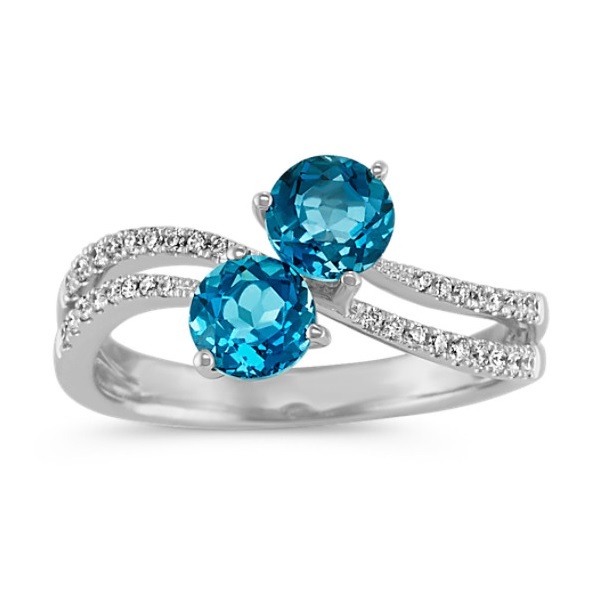 Part of a range called the Twogether™ collection, this unusual two tone ring is dazzling. A strand of rose gold wraps around the pave encrusted band, with two diamonds taking centre stage. The ring would also look incredible in yellow gold and platinum or even in yellow and rose gold for those who love to stand out. Those who prefer brighter, bolder stones will adore this topaz ring that features a pave split band that gently swirls to meet in the middle, where two deeply hued topaz stones are positioned. If topaz is not your stone, you could try ruby, tanzanite, emerald, sapphire, morganite, jade or any other stone that you love. 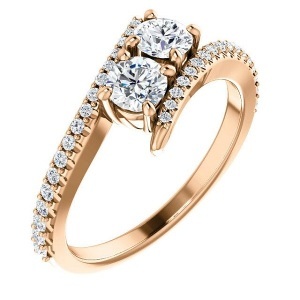 Feminine, romantic, and lovely, this vintage style ring makes optimal use of pave stones to create maximum sparkle. The pave encrusted band leads to two merged stones that are forever bonded. 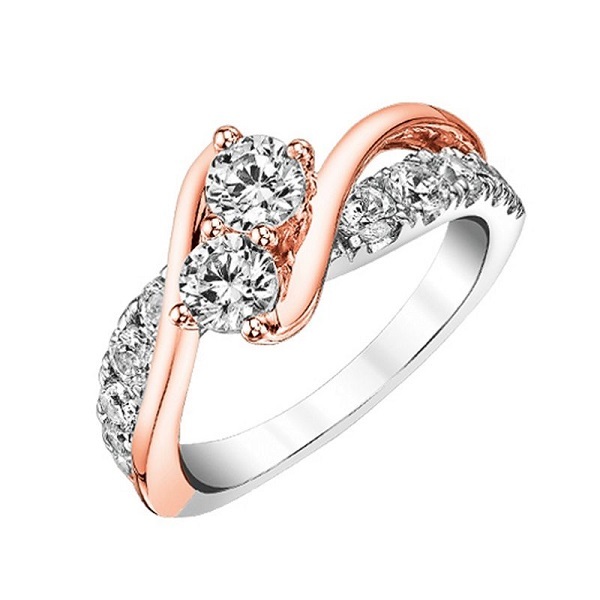 Whether you choose yellow gold, rose gold, white gold or platinum, this ring is a show stopper. If you are looking for a truly unforgettable custom engagement ring in Cape Town, get in touch with Cape Diamonds today. We will help make your engagement ring dreams come true with a wide range of ring collections along with personalised ring design.